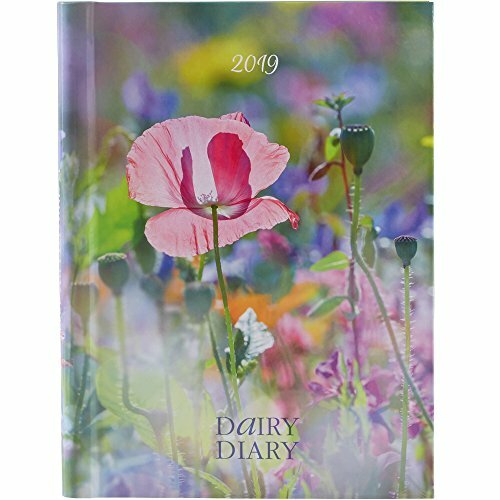 Dairy Diary 2019 2019: A British icon - Dairy Diary has been used by millions since its launch. Practical and pretty, this A5 week-to-view diary features 52 delicious weekly recipes. Britain's best-seller is better than ever! *A5 week-to-view diary * Delicious weekly recipes * Lots of writing space * Memorable dates stickers * Calendars * Gift records * Information for cooks * Useful notes pocket. "I love the Dairy Diary, there's lots of space plus it's full of great recipes, tips & tricks and essential references." Britain's best-seller is better than ever! The iconic Dairy Diary is both practical and pretty - the perfect choice for planning your busy life. With inspirational recipes, which are simple yet delicious with guaranteed results. You can try something new every week throughout the year. *A5 week-to-view diary * 52 delicious triple-tested weekly recipes * Lots of writing space * Memorable dates stickers * Useful notes pocket * Calendars * Reminders* Gift records * Budgeting * Cook's tips. New for 2019: fascinating features on baking, gardening, well-being and travel. "I love the Dairy Diary, there's lots of space plus it's full of great recipes, tips & tricks and essential references."